Description: This Triple Ring Wreath features picots made with Larks Head knots, facing one direction. The center ring is a contrasting color. The beads are optional. To decorate this Macrame wreath, you can add bells, natural items like pine cones and dried berries, or even artificial flowers. 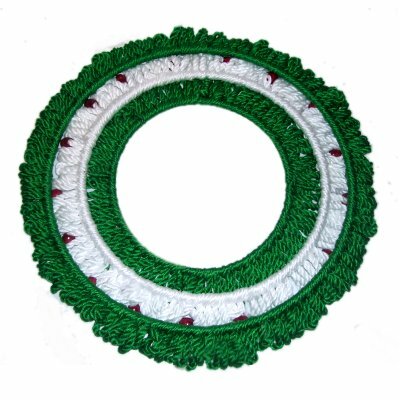 By using green and white and adding red beads, this wall decoration is perfect for the winter holidays. To make it in Autumn colors, try Rust and Gold cord material, with ivory or black beads. This Macrame pattern is rated easy and is suitable for beginners. 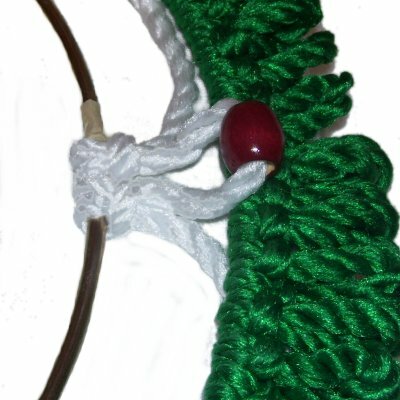 Only two decorative knots are used in the entire wreath design. 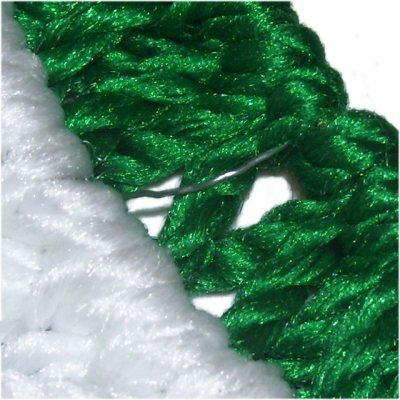 This decoration can be made any size, using the formula provided for the cord lengths. 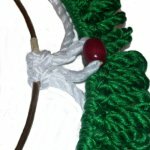 Here is the formula to determine the cords lengths for your Triple Ring Wreath. Divide the cord length by 36 to get the yards (or meters). Add up the cord length in yards, for all three rings, to get the amount to purchase. Prepare both ends of each cord with tape to prevent unraveling. Prepare each of the rings by applying a small piece of tape in one area. The first knot is placed next to the tape, which will help prevent the knots from sliding as you work. Step 1: Use the outer ring first (largest size). Attach the cord to it with a Larks Head knot, with the head facing outward. Slide the knot against the tape, and turn the ring so the knot is vertical, as shown. Fold the cord in half and place it under the ring with the folded area on the outside. Move the ends over the ring. Pass them under the folded area of the cord. Step 1, continued: Move one half of the cord aside, since it will be used to cover the other half of the ring. Roll up each end of the cord by wrapping it around your hand several times, and then secure it with a rubber band. 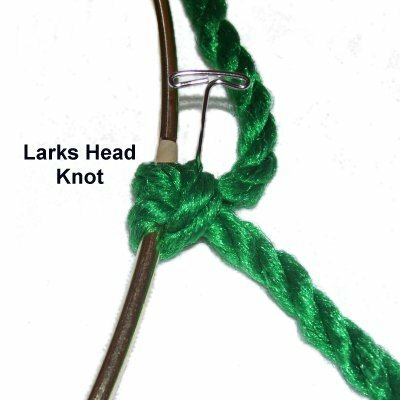 The remaining Larks Head knots for the Triple Ring Wreath are tied in two parts, as shown below. Step 2: Form the picot by pulling the end you are working with to the side, and secure it 2 inches from the ring. 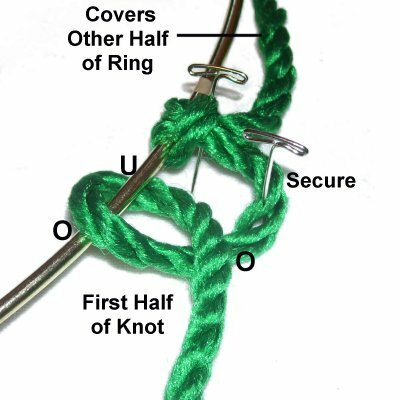 Move the end over - under the ring and over the cord, to create the first half of the next knot. 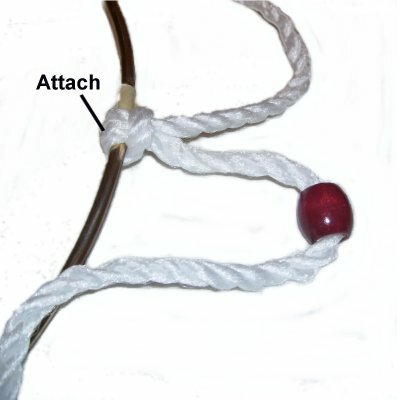 Move the cord under - over the ring and under the cord to make the second half of the knot. 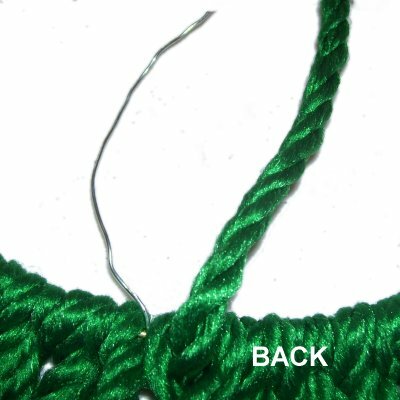 Adjust the size of the picot if needed, and hold it steady while you tighten the knot. Push the second knot against the first. Pull on the picot to tighten the knot firmly. Step 3: Repeat step 2, until the first half of the ring is completely covered in knots. Push the knots close together as you progress. Stop when you have 3 inches left (tail). Step 3, continued: Turn the ring around so you have access to the second half. 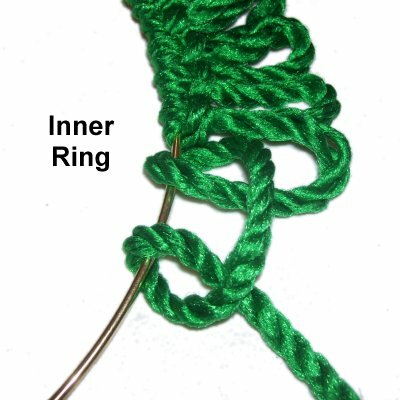 Use the other end of the cord, and repeat steps 2 and 3 to cover the rest of the ring. 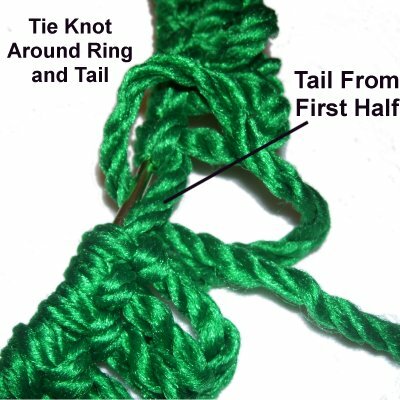 Important: Stop 2 inches before you reach the last knot tied in the other half. Locate the 3-inch tail from the other half of the cord. Place it beside the ring on the outside, heading towards the last knot you just tied. 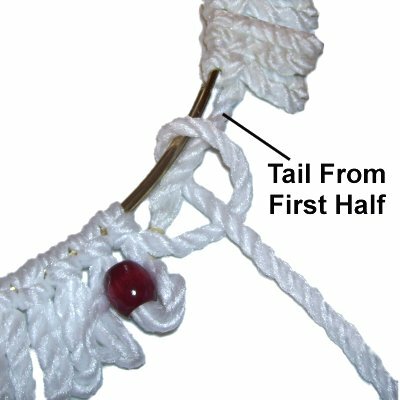 The remaining knots for the second half should be tied around the ring as well as this tail. Tie as many as possible, so the ring is completely covered. Do not cut off the remaining material. Step 4: To start the middle portion of the Triple Ring Wreath, attach the cord to the ring as in step 1. The beads in the following directions are optional. Slide several beads onto one half of the cord, if you plan to use them. Move one bead close to the ring. When you roll up the cord, do so beyond where the beads rest, so you can move them as needed. Repeat step 2, creating one picot loop. 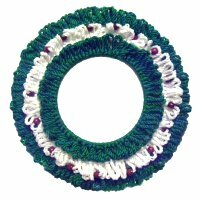 Design Information: The reason for "loading' several beads onto the cord is so you won't need to unroll the material completely, each time you add a bead to decorate the Triple Ring Wreath. Place the middle ring inside the large outer ring. Measure the distance between the two rings. The folded area of the picot you just made should rest on top of the knots covering the outer ring. 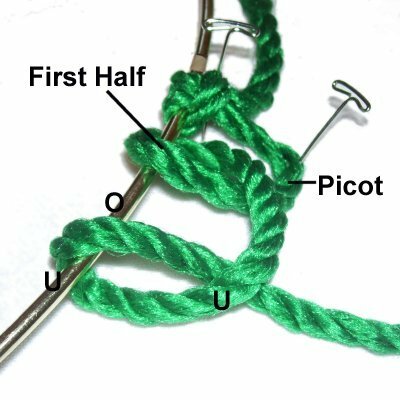 Adjust the size of the picot if necessary. 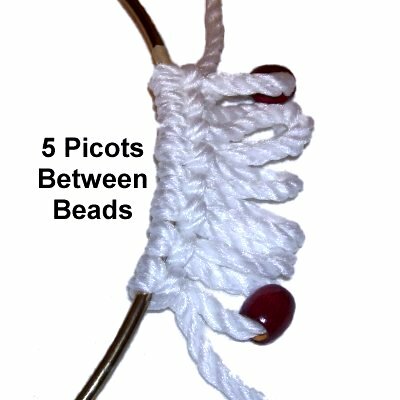 Step 5: Tie 5 picot loops the same size as the first, then slide the next bead into place prior to tying the 6th picot. Tie five more knots, then add another bead. Continue on in this manner until you have 3 inches of material left. Step 6: Turn the ring around, and repeat step 5 to complete the second half. 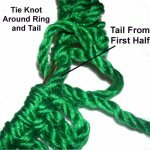 When you reach the area 2 inches from the last knot tied in the first half, move the tail into position and tie the remaining knots around it as well as the ring. Do not cut off the remaining material. Step 7: Repeat step 1, attaching the cord to the inner ring (smallest size). Measure the distance between this ring and the one for the middle, like you did in step 4. 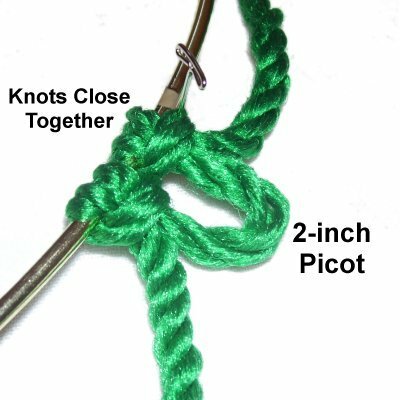 Adjust the size of the picot as needed. Repeat steps 2 - 3, covering the rest of the ring. Do not cut off the excess material. Step 8: Turn over the smallest ring so you are working in the back of the Triple Ring Wreath. Cut one wire, at least 5 inches long. Spread the knots in the area close to the loose end of the cord, and wrap the wire around the ring at least two times. Make sure you wrap from back to front. Step 9: Wrap the end of the cord around the wire several times, leaving the last 2 inches uncovered. Tie a Half Hitch to secure the cord to the wire. Step 10: Place the middle ring around the inner ring, and balance it so there is equal distance all the way around the Triple Ring Wreath. Attach the wrapped wire to the middle ring, being careful not to alter the ring's position. Make sure you are working in the back, and wrap from back to front. Directly across on the other side, attach another wire to connect both rings. Do the same in at least 4 other areas. As you work, make sure the rings remain balanced, with the same distance between them in all areas. Cut 10-inch pieces of cord material, the same color as the inner ring (smallest). You can use the entire cord, or individual fibers. Wrap one cord around each wire to disguise it. Attach each end of the cord to the rings with Half Hitches, next to where the wires are positioned. Finish off the cut ends of these cords by working them through the back of the knots in the area and applying glue. Step 11: Place the outer ring around the other two, and adjust it so the Triple Ring Wreath is balanced. Repeat steps 8 - 10, attaching it to the middle ring. 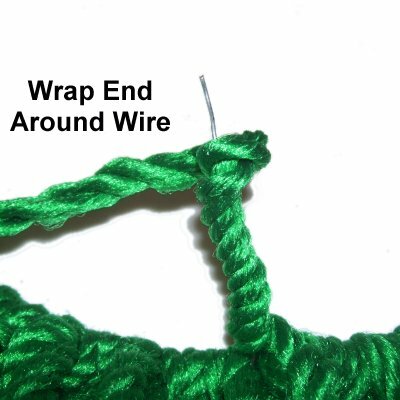 Make sure you use the loose end from the middle ring to wrap the first wire. Use the same color to disguise the other wires. Attach a small piece of wire at the top of the large outer ring, to hang the Triple Ring Wreath to your wall. 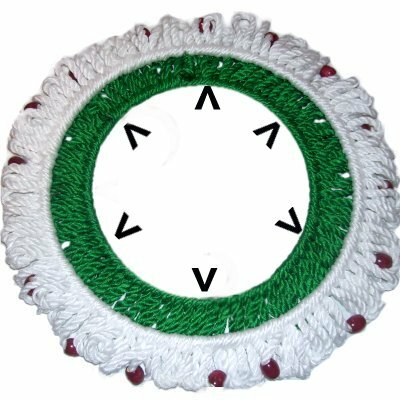 Have any comments about the Triple Ring Wreath? Contact Me.